Josefa Segovia, known by many names such as Juanita, or Pretty Juanita, would have lived and died with not much notice, except for one life-changing event. 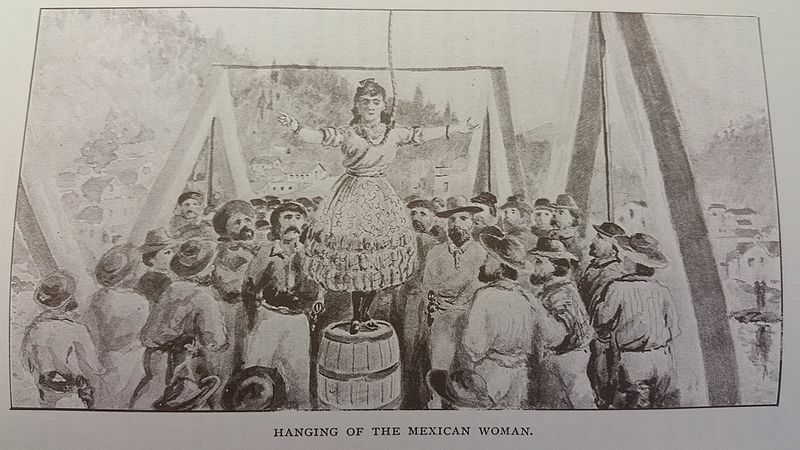 She became the first, and only, woman to be hanged in California. There are as many accounts of what happened to Josepha as she has names. Many are conflicting. Some are obviously biased. I will try to relay what I learned about her when I stumbled across her story while doing research. 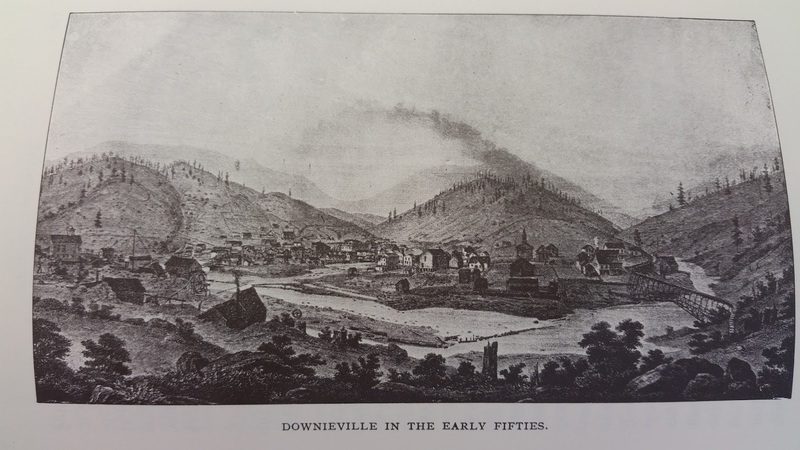 In 1851, Josefa lived in the town of Downieville, California, one of the popular towns during the gold rush. Josefa lived with Jose Loaiza, who was either her husband or her boyfriend. Josefa would have been around mid-twenties, but little is known of where she grew up or her family. Jose worked in a saloon dealing cards for the gamblers. On July 4th, some of the towns gentlemen celebrated a little too much. One miner named Cannon, along with a couple of companions, were stumbling down the road. 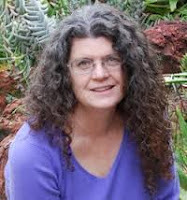 Cannon staggered into the door of Josefa and Jose’s cabin. He hit the door so hard that it broke off the hinges and he fell inside. With his friend’s help he got back up, leaned the door against the frame, laughed and stumbled on down the roadway. The next morning, Jose demanded payment from Cannon for the damaged door. Cannon became angry. Josefa pushed between the men and Cannon began to call her names. She became angry, went inside and when Cannon followed her in, she stabbed him with a knife, killing him. There are several conflicting accounts. Some say Cannon was accosting Josefa, or had in the past. Others say her attack of the man was unprovoked. 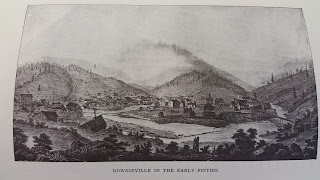 Either way, Cannon ended up dead and the men of Downieville were angry. A mob grabbed both Josefa and Jose. They wanted to hang the pair, but someone suggested they needed a trial first. A jury was chosen and the trial began right then. They held the mock trial on the very platform where the previous day’s celebration of Independence Day had been held. As word spread, the crowd swelled from 600 to more than 2,000. Cannon’s body was on exhibit with his shirt pulled open to reveal the fatal wound. Josefa insisted she had acted in self-defense, but no one would listen. One of the town’s doctor’s spoke up in her behalf and the crowd wanted to hang him too. The jury deliberated the case in a few minutes and pronounced Josefa guilty of murder. She was given two hours before she would be hanged. Jose was given twenty-four hours to leave town and not return. When Josefa said she was pregnant, three doctors were called on to examine her, but determined that she was not pregnant, so they could continue with the lynching. About 4:00 pm, Josefa was taken to the bridge over the Yuba River. She refused to wear a mask. She put the noose around her own neck and tied her skirts down for modesty. Turning to the crowd, she gave a jaunty salute and stepped off. In a editorial in the Daily Times and Transcript, the paper said, “…the violent proceedings of an exited mob are a blot upon the history of the state…” They went on to state that these actions of the men shamed their race and themselves. It is hard to say what is truth in this story, but most of them that I read, agreed with the fact that Josefa was brave to the end. She refused to cower and beg, and she maintained her innocence of murder, even as she admitted to killing Cannon. I would love to hear your thoughts on this story. I find it sad that the mob mentality meant the death of a young woman who may have been innocent. It’s hard to believe all this happened over a broken door and too much to drink. They even wanted to hang the doctor? Wow. I know there used to be hangings, but I never really thought about if women were hung. There were women outlaws, but I guess none of them were caught in California? Definitely never heard of Josefa before. Sad, indeed. Yet, I'm not surprised, they are called mobs for a reason. Very interesting post. Thanks for sharing. Thank you for commenting, Chappydebbie. Mob mentality is a scary thing. Josefa Segovia is new history to me. What a sad time in America History with men hanging her for a self defense act. Thnak you for this interesting but sad blog post. I agree, Marilyn. It was a very sad time. Thank you for stopping by. We can witness that same mentality today with all the riots. Truth, Melody. We see this way too often. Thank you for commenting. Fascinating story! This would make a good movie. I agree, Joseph, this would make a great movie. Thanks for stopping by. since it sounds like she was defending herself. I agree, Kathleen. Heat-of-the-moment justice isn't a good idea. Thank you for sharing your most interesting post, Nancy. Melanie, thank you for stopping by. I'm glad you found the post interesting. Thank you for you post. I just stumbled across this story. I've been looking for images for an art piece that I've been wanting to create that ties in with the injustices. In our town we have a statue (the Fallon statue)that as a Mexican American women I find offensive. 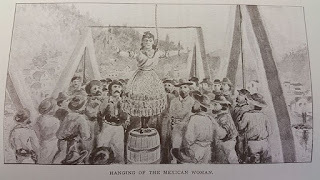 I was looking for an image of lynching of Mexican Americans to use as a juxtaposition and I found Josefa. Maybe she wants another side of her story told. I honestly believe there is more to this story. First why was he even near her door with a group of men. Maybe she was raped and she did not want to tell others that this was the case. I have been reading other accounts written by men and they are laughable and prejudicial. They paint her out to be some vicious small latina women while he was a gentle giant. Thank you again for writing something that leaves a reader to think rather than have a bias brush. Yolanda, thank you for your comments. I tried so hard to be unbiased in my telling of Josefa's story, even though part of me wanted to cry out at the injustice. I do hope my retelling caused others to think about what might have happened. I hope your art work inspires many. It’s sad to say but not that long ago, women really didn’t have to do much to get looked at badly. We cant forget the past. We can’t forget how small our female voices used to be...no matter the content. But all in all, it’s easier said through today’s eyes, when imagining living in the shoes of women in our yesterdays, the things we would have done differently. I love hearing stories about women who went against the grain of their times. We can’t forget them and again, we shouldn’t forget the past. We can knock down the statues that offend people and rearrange and hide stories, but that will only do exactly what it’s doing. The truth hurts. We can’t let the kids of tomorrow think that nothing bad ever happened in the past, those horrible statues need to stay put for a reason. Thanks again for being a voice. Mikka, Thank you for your comments. Josefa's story is sad, yet inspiring in that she was such a strong person. I do appreciate your insights.